Last summer June 2012, the eCrafts Collective (Ramyah Gowrishankar and Kati Hyyppä) made a journey to the Latvian countryside in order to explore traditional women's costumes. They had the pleasure to stay in a residency at Interdisciplinary Art Centre SERDE, located in a small historical town called Aizpute, meeting many nice people who taught them traditional heritage crafts. Gowrishanker & Hyyppä's explorations resulted in two eCrowns, which are pimped up versions of Latvian traditional single women's headgear. It is a pleasure for Pixelache to highlight and promote them today on International Women's Day. As the Latvian crowns are traditionally worn by unmarried women, one of the eCrowns, the Sirius Crown, helps single women in finding potential marital partners. Partner candidates are sensed by an ultrasonic distance sensor, which triggers sound and light effects according to the mood selected by the crown’s wearer. The other eCrown, called the Dancing Crown, is a fun crown to put on as it glitters and shines with the wearer’s movements. It was inspired by our experiences of visiting a local folk dance group and uses the dancing movements as a source for triggering small lights in the crown that flicker like fire-flies complementing the dancer’s steps. Learn how the crowns were made with this excellently documented 'making of' post. The eCrafts Collective are Ramyah Gowrishankar and Kati Hyyppä, who joined their forces in the quest for fascinating, unexpected and delightful combinations of crafts and electronics. Last year, as part of Pixelversity's programme 2012, they collaborated together with their first e-embroidery workshop, and the participants presented the outcomes during Camp Pixelache 2012.
eCraft Collective's residency was supported by Kultur Kontakt Nord's residency grant programme awarded to SERDE. 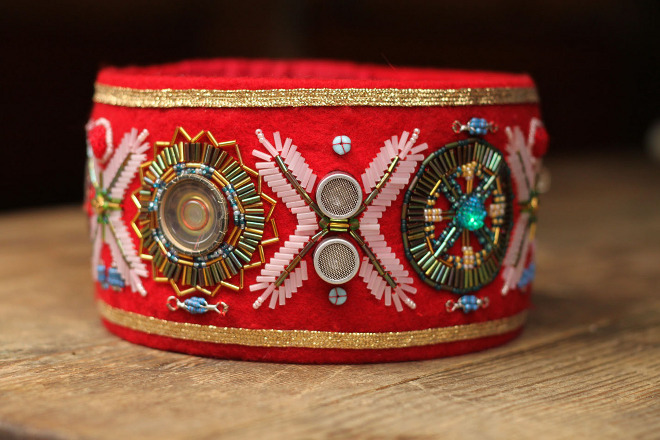 Andrew has the pleasure of delivering the finished Dancing Crown to Aizpute later this month, to join the Sirius Crown for safe-keeping at SERDE.